Ep.1: "It Smells Like Success"
Ep.1 idolvantage: Ron picks up an "advantage" in the marooning; it's a clue to a time-limited "advantage menu." Ep.1 Immunity challenge: "Social Network" - After building up a huge lead on the balance beam, Kama wins. 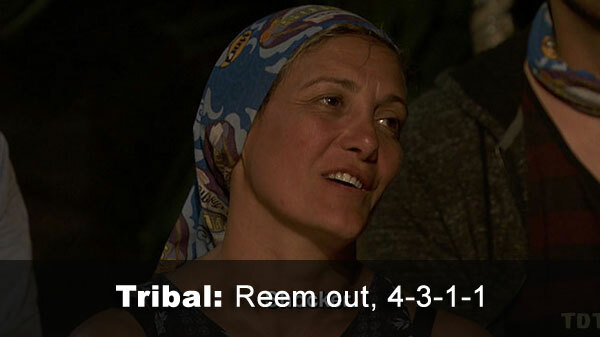 Ep.1 voted out: Reem, 4-3-1-1, over Wendy, Kelley, and Lauren, respectively. 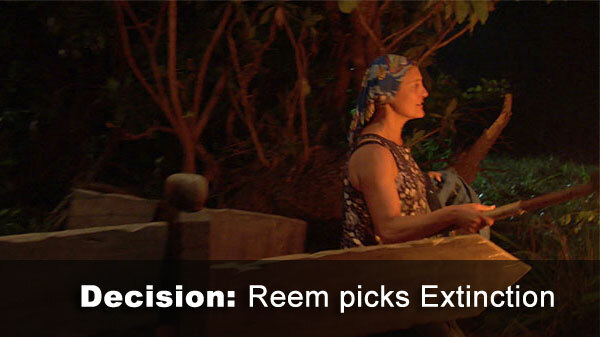 Ep.1 decision: Reem chooses to go to Edge of Extinction, because who wouldn't? 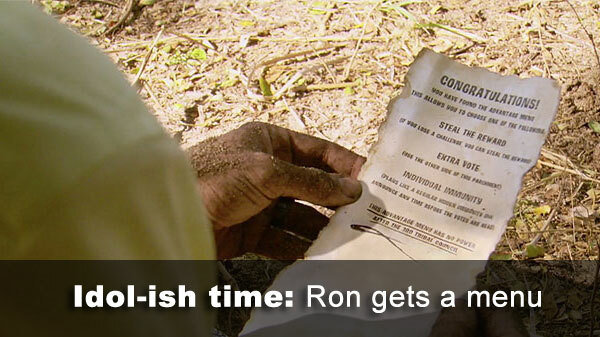 - Ron's menu expires after the third Tribal Council, and could be a (1) reward steal, (2) extra vote, or (3) idol. So it's unclear if it's an idol or advantage at this point. - Reem received 4 votes, from Chris, David, Keith, and Rick (voted out, 4-3-1-1). - Wendy received 3 votes, from Kelley, Lauren, and Wardog. - Kelley received 1 vote, from Reem. - Lauren received 1 vote, from Wendy. ChW: Challenge Wins. For tribal challenges, a contestant earns a fraction of 1 win, depending on if they participated (no points for sitting out). 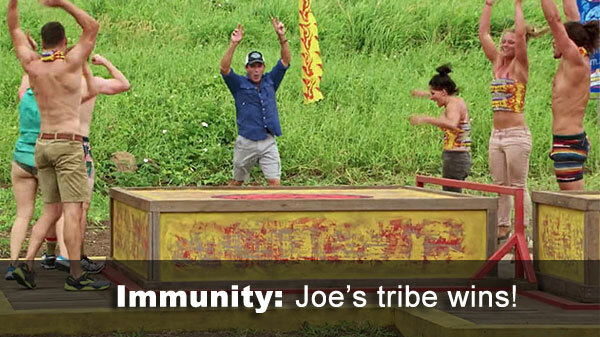 So in a five-person tribe's win, each participant gets (1/5) of a point, or 0.2 points. Duels (or individual RCs as in Ep1) at Redemption Island count as half a challenge (and half a win). Individual challenge wins count as a full point. ChA: Challenge Appearances. Used to calculate ChW%. Fractional for tribal challenges (same as ChW), except sit-outs get charged for an appearance, because they could have participated. ChW%: Challenge Win%. Simply, ChW% = ChW / ChA. SO: The number of times a contestant sat out of a challenge. VFB: Votes For Bootee. The number of times the contestant has voted for the person who was ultimately voted out. Applies only to initial votes (no points for revotes in case of a tie). Special case: In a final three TC, where only one vote is cast (by the F3 IC winner), only that vote counts. VAP: Votes Against the Player. The total number of tribal council votes cast against the contestant. Again, only initial votes count (no penalty for revotes), and here a hidden immunity idol (if played) erases the votes. In the special case of a final three tribal council above, only the F3 bootee receives a vote against. TotV: Total votes cast during the tribal councils the player has attended (again, only initial votes count). Used to adjust for different vote totals as tribes shrink. TCA: Tribal council appearances. The number of times a contestant has attended tribal council (at which they voted). TC%: Tribal Council percent. Attempts to reward voting for the bootee (which players controlling the vote almost always do), while punishing receiving votes yourself. The formula is: TC% = [VFB - (VAP/TotV)] / TCA. wTCR: weighted Tribal Council Ratio. Very similar in intent to TC%, but calculated as a ratio of VFB to VAP, while also scaling to a uniform number of TC appearances. The formula is as follows: wTCR =2* [VFB / (4+VAP)] x (14/TCA). I originally tried (1+VAP) to avoid dividing by zero, but this overly rewarded getting zero votes against relative to just one vote against, which seemed silly. (4+VAP) scaled that effect back comfortably. 14 was used as the scaling factor for TC appearances because there are usually 14 episodes, then a final scaling factor of 2 to bring maximal scores up to roughly even with ChW and JV% high scores. JVF: Number of jury votes for the contestant to win. Maximum nine (Earl Cole, Fiji), theoretically. TotJ: Total number of jurors. Necessary to not punish unanimous 7-juror winners (JT Thomas, Tocantins). JV%: The percent of total jury votes cast for the contestant, or Jur% = JVF/ TotJ. This number is used, raw, in SurvSc, and is scaled in SurvAv (multiplied by six) to make it similar in size to ChW and wTCR. Survival Score (SurvSc). It's simply the sum of Challenge Win% (ChW%) + Tribal Council% (TC%) + Jury Vote%, for a maximum possible score of 2 (3 after the finale). Survival Average (SurvAv). It's a simple sum of fractional Challenge Wins (ChW), weighted TC Ratio (wTCR), and (eventually) a weighted Jury%. The latter two max out at six points total, for a theoretical maximum score of around 18 or so.